Last year, four Bienen students formed a saxophone quartet, specializing in the performance of new music. ~Nois will play their first professional gig in Chicago at Constellation. When people think of the sound a saxophone makes, they usually conjure the image of a man playing smooth jazz on a street corner. The same scene is applicable for ~Nois — a Bienen-born quartet — only their instruments sound more like the collective of noises in the background: Their saxophones can cover a range from the honking of the car horns, to the chirping of birds, to the clicking of heels on the sidewalk. 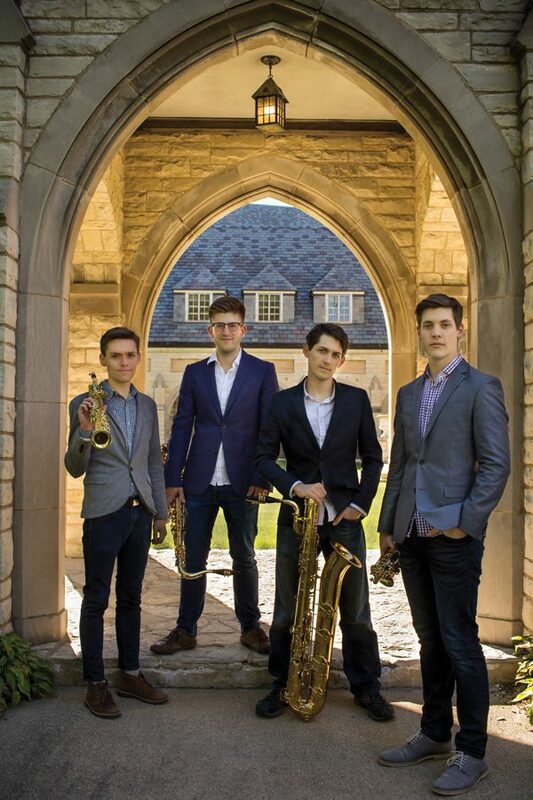 Last year, four Bienen students formed the saxophone quartet, specializing in the performance of new music. A little more than a year later, they are preparing to play their first professional gig in Chicago at Constellation. The quartet is made up of four Bienen graduate students: Brandon Quarles, Hunter Bockes, Jordan Lulloff and János Csontos on soprano, alto, tenor and baritone saxophone, respectively. The performance will feature the music of several composers that live and work in the Chicago area, including three pieces — two of which will be performed for the first time — written specifically for the group. One of the world premieres, “Vaisseau Fantôme,” was composed by Niki Harlafti, a Bienen doctoral student in composition. A large painting by Mexican artist Francisco Ledesma inspired Harlafti to write the piece, Lulloff said. The painting will be projected on the screen behind the quartet as it plays. Craig Davis Pinson, another Bienen doctoral composition student, wrote the other piece that will be featured in the concert. Csontos said although most of the pieces are by NU composition students studying under the same professors, they all have very distinctive sounds. To this point, Marcos Balter’s piece, “Intercepting a Shivery Light,” draws inspiration from a Radiohead song, Quarles said. Pinson’s piece, on the other hand, is very percussive in nature, featuring lots of rhythmic clicking of the instrument’s keys, Lulloff said. Many of the modern pieces played by ~Nois feature nontraditional notation. Instead of scores with traditional music techniques –– such as notes, keys and measures –– composers write the music in ways that allow for more interpretation from the artists. For instance, one of the pieces is written not with notes, but with different shapes that the performer must artistically interpret into sound. Many of the techniques the performers use to play are unconventional as well. One piece on the program, David Reminick’s “Consort,” is written for four soprano saxophones, though none of the instruments are meant to be in tune with each other. When the saxophone is manipulated in this way, it can become difficult to produce sound, Csontos said. Bockes said he didn’t have experience in the unique techniques required to play some of ~Nois’ pieces before he came to Northwestern. He said it’s been difficult to put aside his classical training and perform with his saxophone in new ways. “(It’s) been like relearning how to play the saxophone,” he said. There is only one piece on the upcoming concert where all saxophonists play in the traditional style. Lulloff, whose parents are both classical saxophonists, said he grew up listening to them perform traditional pieces numerous times. ~Nois is planning to tour the southeastern U.S. in the spring, where it hopes to play gigs in as many places as it can, including universities and high schools. Although three ~Nois members will graduate at the end of the year, Csontos said they have all decided to remain in the Chicago area for the next few years.